Preventing collisions on the airside movement area and reducting the taxiing time as well as the risk of Runway Incursion, especially during low visibility conditions, are topic issues. For these reasons, ICAO prescribes the implementation of an (Advanced) Surface Movement Guidance and Control System ((A)SMGCS). P.R.C. Elettronica provides a solution that helps to meet this requirements. 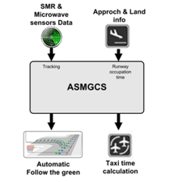 SMGCS system works surveillance, monitors taxiing traffic continuously and guides aircraft and vehicles reliably through the use of optical signals, warning about potential collision routes. The integration and interoperability with other systems developped by P.R.C. 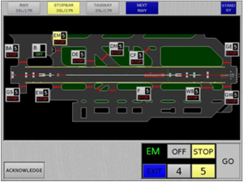 Elettronica, such as Airfield Lighting Control System and peripheral computers used for punctual lights monitoring and control, enhances greatly the airside safety and efficiency.